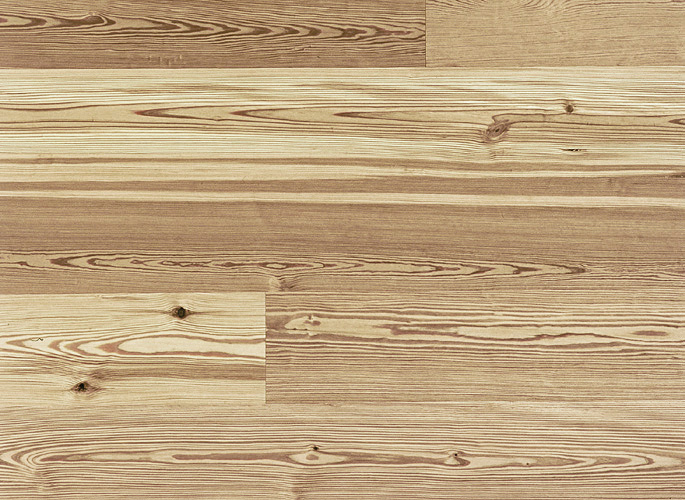 Wide Plank widths from 5" to 8" Thickness: 1⁄2"
Historic wood from 19th century structures is re-milled and prefinished to make this unique, precision-engineered Antique Reclaimed Heart Pine flooring. Not just a renewable resource, Antique Reclaimed Heart Pine is a renewed resource. Select grade is a mixture of plain and vertical grains, 90-100% heartwood, chosen for character and warmth. Other hand-selected grades of Antique Reclaimed Heart pine are also available. For floating, staple or glue-down installation on a sub-floor of OSB, plywood, concrete and for use with a radiant heating system. Lifetime structural warranty.